Sony has announced their new full-frame 24mm F1.4 G Master prime lens (SEL24F14GM). Despite a very fast maximum aperture of f/1.4, the lens remains small and light lens compared to its peers, weighing in at only 445 grams (15.7 ounces). For comparison, the Sigma 24mm F1.4 Art is 50% heavier and considerably bulkier, however it is cheaper than the Sony. The 24mm F1.4 GM has a total of 13 elements, including two XA (extreme aspherical) which help to reduce coma, and three ED elements. Sony’s Nano AR coating helps to reduce flare and ghosting. The 11 aperture blades yield a smooth bokeh and circular out-of-focus highlights even when you stop down to f/2.8. You also get 22-blade sunstars if you stop down further. It features a manual focus ring with a linear response which can be very useful for shooting video. There’s also an aperture ring (with a ‘de-click’ feature), customizable focus hold button and AF/MF switch are also available. 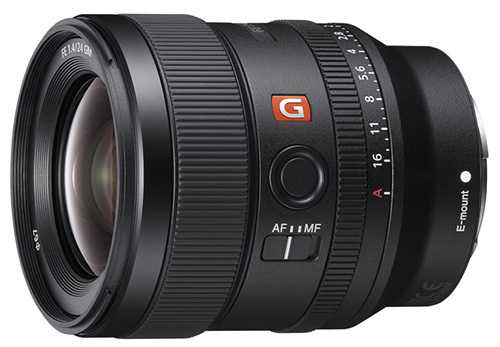 As with all G Master lenses, the 24mm F1.4 is also sealed against dust and moisture. The Sony FE 24mm F1.4 GM will ship in October for $1,398.00 in the US and £1,449.00 in the UK. The SEL24F14GM won’t start shipping till October, but you can already place your pre-order from the following stores.